Did you know that viruses and trojans can get into your PC by means of download? That’s the truth. If you have been a dedicated Google Chrome browser you would agree with me that there are weird moments when you open a website and then comes pop up ads and then a file starts downloading on your PC or Android device without your authorization. Files that download in this manner could be very harmful to your PC. It is advisable to stop automatic downloads on your Google Chrome browser and I will show you how you can do that. So, the process of stopping automatic downloads on your Google Chrome browser is actually a manual one. Yeah! you will need to manually add websites to the block list. You need to have or know which specific websites download files automatically. The process of stopping automatic downloads on Google Chrome isn’t a tough one. The steps are quite easy to follow. Before you even think of trying out any of the steps below. I’d advice you to update your Google Chrome to it’s latest version. 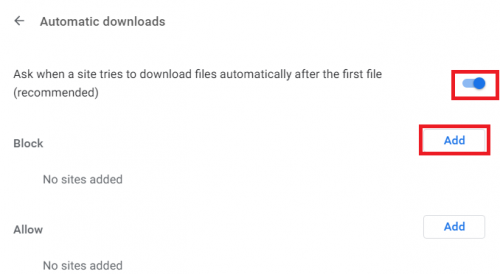 So, here is how you can stop Automatic Downloads on Google Chrome. 1. Open your Google Chrome browser on your PC. 2. Click on the utility icon at the top right. 4. Scroll down and click on advanced. 5. From the list of options click on content settings. 6. Click on automatic downloads. 7. You will see a text that says “do not allow any site to download multiple files automatically”. Turn it on. 8. If you know websites that always download files automatically you can add them manually by clicking on the Add button, inputting the URL and finally clicking on an “Add” button again. So, there you have it guys. In just 8 easy steps that’s how you stop automatic downloads on Google Chrome. You can add as many sites as you want to the block list. And Hey! Whenever you want to, you can also remove any added website to the block list. Just follow the same steps to get there, click on the utility button beside the website you want to remove and click on remove. Okay, folks, that’s a wrap. That’s how you stop automatic downloads on Google Chrome. I hope this article was helpful to you, if yes, you could help spread the word by clicking any or all of the share buttons below to share this content with your friends and family. Q: How many websites am I allowed to block? A: There’s is no specific number of websites that you can stop from automatically downloading files. You can stop as many as you can.